From the 8th until the 23rd of December 2014, I have visited the Institute of Reconstructive Neurobiology, Life and Brain Center of the University of Bonn in Germany, using funding from the short term scientific mission (STSM) program from COST Action BM1207. My project focuses on the development of genetic therapies for polyglutamine disorders. For one of the polyglutamine disorders, spinocerebellar ataxia type 3 (SCA3) we have recently shown the feasibility of removal of the toxic polyglutamine repeat from ataxin‐3 through antisense oligonucleotide-mediated exon skipping. Our experiments are performed in non-neuronal cells, which do not show a disease phenotype. At the Institute Reconstructive Neurobiology they are experts in the differentiation of SCA3 patient-specific neurons derived from pluripotent stem cells (iPSC). With SCA3 patient-derived neuronal cells they showed SDS-insoluble ataxin-3 aggregates after excitation. These insoluble protein aggregates in the brain of SCA3 patients are an important hallmark of the disease. These iPSC-derived SCA3 neurons provide a unique tool to investigate whether ataxin-3 exon skipping results in reduced mutant ataxin-3 aggregation. The aim of my 10 week visit to the Institute Reconstructive Neurobiology was to learn to differentiate these iPSCs and transfect our ataxin‐3 antisense oligonucleotides to assess exon skipping levels. We have used a fluorescent labelled oligonucleotide to study transfection efficiencies after various combinations and concentrations of antisense oligonucleotides. We could successfully transfect our ataxin‐3 antisense oligonucleotides in these iPSC-derived SCA3 neurons and skip the exon in which the CAG repeat is located. The STSM has been a very interesting experience. I have attended work discussions and talked with many scientist and acquired various new ideas for future research. I have gained much knowledge on iPSC differentiation, culturing and transfection. 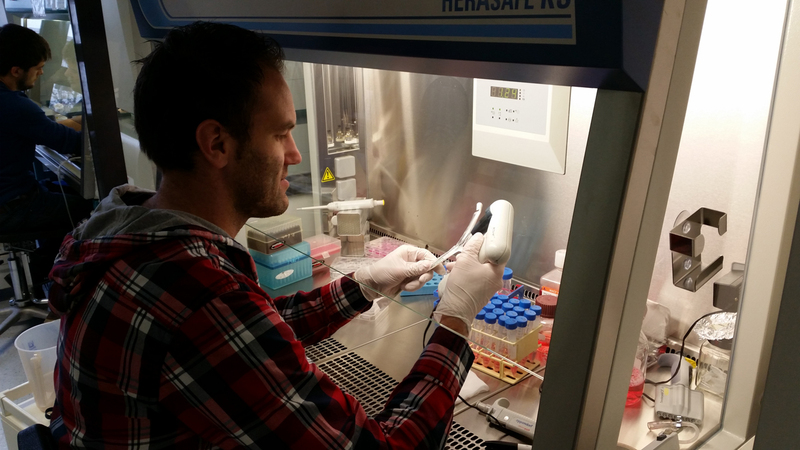 The STSM has resulted in a fruitful and continuous collaboration with the group of dr. Philipp Koch. In the first half of 2015, I will go back to Bonn to further optimize this ataxin-3 exon skipping in iPSC-derived neurons and study its effect on aggregation of expanded ataxin‐3 protein.